The National Capital Planning Commission approved final plans last week from the National Park Service that include eliminating the paved loop near Memorial Bridge that used to be the end of Constitution Avenue in Northwest. The change would allow for a straighter trail and a traffic shift to make accessing the Memorial Bridge a right turn rather than a straight shot so that people walking, running or biking on the frequently crowded trail no longer come out of nowhere for drivers, and so people on the trail do not have to blindly guess whether someone they cannot see is walking or biking around a high wall. Part of the paved loop, known as the Belvedere, would still be marked with stones. It could host a new national memorial of some kind in the future. The park service also plans to build a wider and smoother trail at other points in the area under this plan, including through a new separated tunnel under the Roosevelt Bridge, past the Kennedy Center where a new connection is planned as part of an expansion project, and at better intersections at F Street and Virginia Avenue in Northwest. 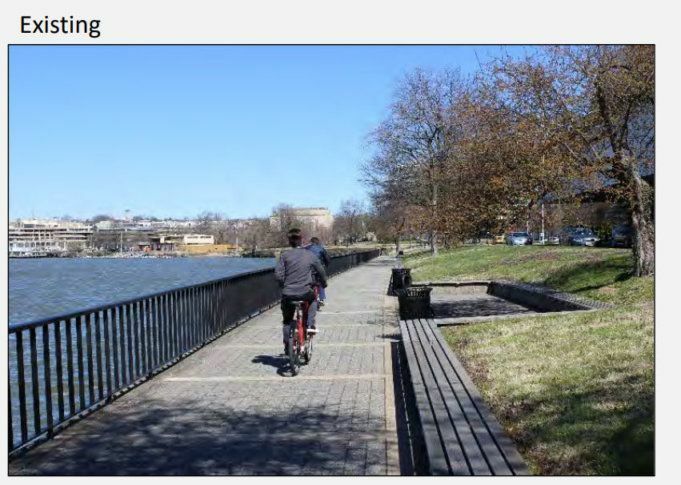 Additional trail repaving and widening is planned south of Memorial Bridge down to the bridge over the inlet to the Tidal Basin. This work is separate from improvements just to the north of this area for the C&O Canal in Georgetown.